Today we’re happy to announce the official launch of TinyCat, the online catalog solution for tiny libraries. In other words, YAAAAAAAAAAAAAY! What’s this all about? Religious institutions, community centers, small schools and other “tiny” libraries (up to 20,000 items) have used LibraryThing to catalog their collections for years. 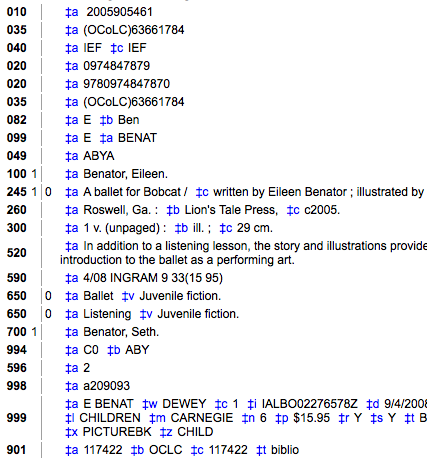 TinyCat gives them an attractive and powerful library catalog, with easy-to-use circulation and patron-account features. Professional. Robust circulation and patron log-in features, and a “Simple Circulation” option for classroom libraries. Flexible. Import and export MARC records. Enhanced. Enhanced with optional professional and user reviews, recommendations, and more. See TinyCat in action. Folio, a member-supported library and cultural center in the heart of Seattle, uses TinyCat. Check it out here. Try it out. Already have a LibraryThing account? You can see your LibraryThing collection on TinyCat by starting here. Find out more, including Frequently Asked Questions, pricing, and how to get started at https://www.librarycat.org. Let us know what you think on Talk, or email tinycat@librarything.com. Join the TinyCat discussion Group on LibraryThing here: http://www.librarything.com/groups/tinycat. Visit us at PLA. Stop by booth #437 at PLA in Denver this week to meet Tim and get an in-person demo of TinyCat!